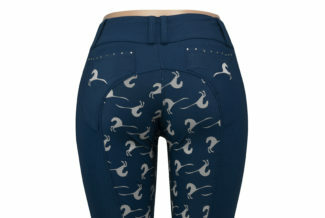 Breeches for your everday life! You will never want another pair of breeches. 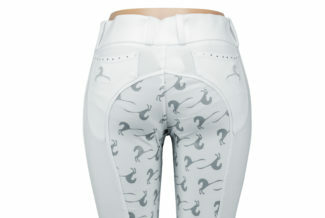 These are our most popular fullseat breeches with silicone grip. Order yours today! Our loss is your gain!!! These white breeches were unfortunately made with the wrong material in production and no one caught the mistake until it was too late, so they are a little more see-through than we originally planned for. Due to this production mistake, we have applied a hefty discount. Hear what our clients have to say about our riding breeches. ⭐⭐⭐⭐⭐ Love these breeches! I won the grey pair in a contest on Facebook, the first time I wore them was in a jumping lesson with my trainer and I LOVED them. Super comfortable- I can have a tough time with breeches because I am 5’10”, but these fit so great, I ordered a 2nd pair in black. 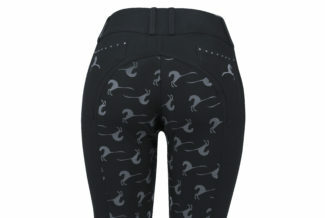 Super stylish and cute, they are definitely my new “go to” breeches for schooling and lessons and trail rides. Thank you Dressage Couture Designs! ⭐⭐⭐⭐⭐ I absolutely love my DCD breeches. They’re stretchy and light like a riding tight, but with the sturdiness and secure feeling of regular breeches. The silicone lays flat and doesn’t leave marks on my saddle like others do, but helps keep you quiet in the saddle during those unexpected moments of flight. And they’re cute and get lots of compliments! ⭐⭐⭐⭐⭐ My favorite breeches! I can wear them all day through feedings, arena maintenance, grooming, and riding and they are comfortable and look great through it all. ⭐⭐⭐⭐⭐ I have been riding in these breeches for a few months now and I love them! They are super comfortable and I love the grippy ponies on the seat. I especially like that there are front and back pockets. I always get compliments on them when I wear them at clinics and they are super comfortable for every day training. They have held up really well too! ⭐⭐⭐⭐⭐ OMG!!! Holy stretch!!! I was on the fence about buying these before I lost my pregnancy weight but I am SO glad I did.. I would seriously sleep in these they are so comfortable! I was on the fence of getting a M or L but decided to go smaller for when I loose the weight and I’m glad I did. They have so much give and don’t cut into my C-section line like all my other breeches. Seriously one of the best buys all year!! ⭐⭐⭐⭐⭐ Love these breeches! Extremely comfortable in and out of the saddle, love the bling and contrasting color design on the seat. Highly recommend them! ⭐⭐⭐⭐⭐ These breeches are great. They have great stretch but hold their shape. They design of the bling is so cute.. I always have such a hard time finding breeches that fit correctly….Thanks you guys!! ⭐⭐⭐⭐⭐ I just got my first pair of breeches and I’m OBSESSED. Tights for adults is how I’d describe them…. lightweight with a ton of stretch, a proper full seat with silicone the perfect amount of stickiness, a wide waistband that actually sits at my waist instead of digging into my hipbones. I’ll definitely be buying more pairs. Oh and the turnaround time between ordering and arrival was impressively fast. We offer affordable products for anyone’s budget. Our products are made with quality in mind, to last you for rides to come! We have a wide variety of happy customers that love using our products! 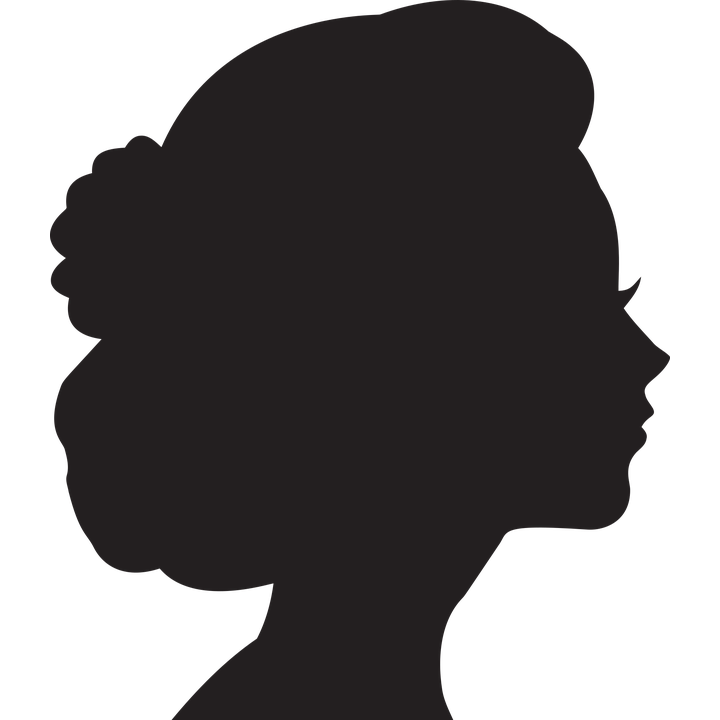 Our team is full of horse lovers and dressage riders, so expect a lot of thought put behind every product we make.